First you need to find the posters online and download them. A quick search on Google for “*TV SHOW* Season 1 Poster” will give you plenty of results to choose from. 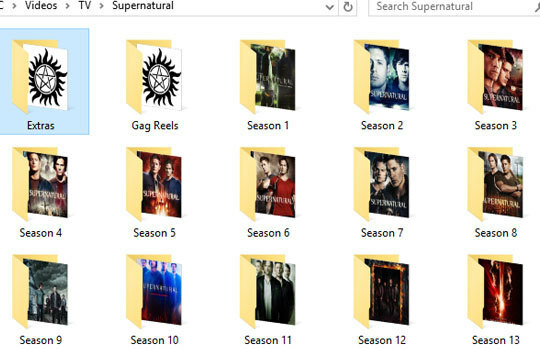 Make your choice (it must be a jpg file), download, it, then put it into the folder that holds all your season’s episodes. Once there, change the name of the file by right clicking on it, then clicking Rename. It doesn’t matter what it was named before, just change it to “folder” with no caps or spaces. The file has to be a jpg or this won’t work. Once you’ve done that, back out of your folder and your folder preview should be the poster. If not, right click on blank white space and click “Refresh” on the pop-up menu. Continue doing this for each folder until all your folders show the posters for each season. This works for any folder on a PC, so if you organize your music or books in separate folders, just change your preferred preview pic to “folder” and make sure it’s a jpg. All your folders can have customized previews. I know there’s a way to do something similar on Mac, but I don’t know how to do it.